The Romantic Dinner in the Wine Room is gaining popularity on a weekly basis! Not only are couples looking for a smart way to spend their romantic monies, they are looking for options. 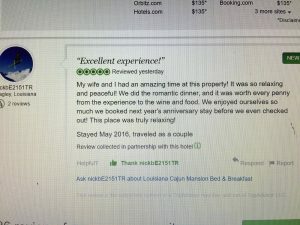 Many couples come to the Louisiana Cajun Mansion Bed and Breakfast as a romantic get-away or for just a relaxing weekend get-away. 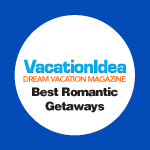 There are many options here at the B&B from Champagne, Roses and Chocolates in the bedroom suites, a Picnic under the trees to Couple Massages. You name it, we probably have it. 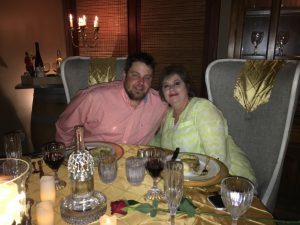 This weekend Angie and Nick were celebrating their wedding anniversary and the Romantic Dinner in the Wine Room was on the agenda. Everything was a secret and all Angie knew was to pack her bags for the weekend; how romantic! Nick and the Inn Keeper had coordinated the details. On Saturday night Nick told Angie they were going out to dinner; they dressed up for the special event and proceeded to walk out the house to go to some nice restaurant. Angie was still on high and loving the spirit of surprises; she claims she was always a control nut and enjoyed not being there for the weekend. But, Inn Keeper Sandra Booher stopped them and held a casual conversation about their day and asked Angie if they were going out to dinner. Angie says, “Yes! I am not sure where we are going because its a surprise!”. Inn Keeper says “Angie and Nick, I would like to invite you to a romantic dinner in the wine room”. Angie was very much surprised and she loved the idea; in fact when she saw the paperwork in the bedroom, she wished they had booked the dinner! Full of excitement and anticipation, they were both eager for the romantic dinner journey. They were dressed up and ready! The look on Angie’s face was priceless and Nick knew that he had scored a home-run. The room was also ready and it set the tone for what was coming next. 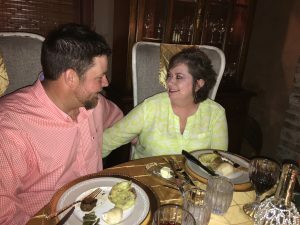 Imaging this… Soft love music was playing, candles were lit, there were only chairs for two people in the room and the table was stunningly decorated with Waterford China, Mikasa Crystal and William & Son Gold Flatware. Angie’s long stem red rose was waiting for her on her plate setting and set the tone for love, love, love. They started their romantic dinner with champagne toasts and exchanged special words to each other. There wasn’t anything missing including the fine details. Then the elegant dinner started! (You can bring your own champagne and/or wine). The first course was Caprese Skewers Appetizer served in a beautiful Mikasa Martini Glass. Not only is a beautiful dish, it tastes really good too! See the recipe for the Caprese Skewers if you want to fix it at home! The second course was the shrimp and corn bisque and we paired it with complementary wines that they both enjoyed. The bisque was very creamy and there was no short cuts in how it was prepared; all fresh ingredients and was made right there in Sandra’s kitchen. They loved the bisque and they wanted the recipe too! The third course was our house salad with our own house salad dressing. The presentation of the salad was beautiful and it was served on the elegant Waterford china salad plates. The salad was prepared fresh and the salad dressing was home made with fresh ingredients. The salad is to die for and by now you’re wondering, wow what’s next. The fourth, fifth and sixth courses came out next and they are served on beautiful Waterford china plates. Filet Mignon Medallion, Stuffed Potato, French Bread and Green Beans wrapped in bacon. What a beautiful presentation on the plate. Although the couple did not previously enjoy red wine, I presented them with a complementary glass of merlot; and they loved it! 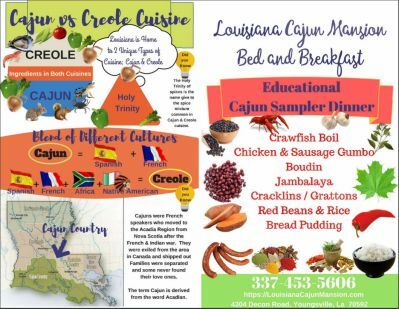 It went perfectly with their filet mignon and the rest of the Cajun food in their plate. The seventh course was the dessert and they were ready saying… “What could be next?”! The best bread pudding you’ll ever eat was placed in front of them and of course I paired it with a complimentary dessert wine. Needless to say, Angie and Nick were very pleased with their Romantic Dinner in the Wine Room. 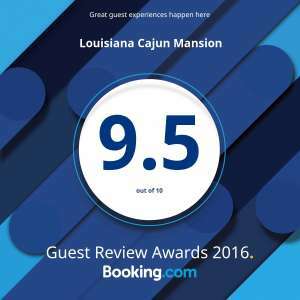 See what they had to say on Louisiana Cajun Mansion on Facebook Reviews page. 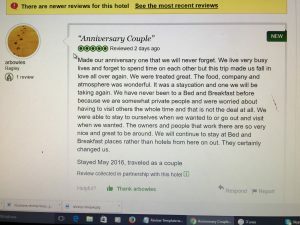 They have already booked their next Anniversary Stay at the B&B for next year and we are looking forward to having them again. Thank you Angie and Nick for being awesome 5 Star Guests.